Winner of San Francisco Int'l 2007, Winner of DocAviv 2006, Israeli Academy Award for best documentary 2006, Second Audience Choice award of IDFA (Amsterdam) 2006. 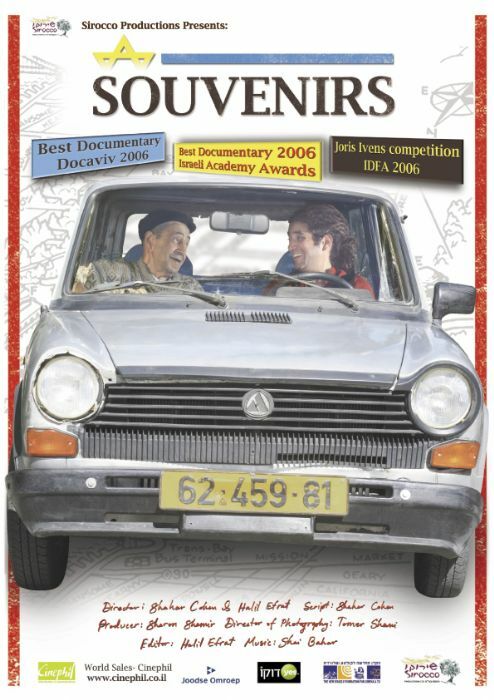 A charming, funny and touching father/son journey in search of the "Souvenirs" the father may have left with local girls during his service in the Jewish Brigade while stationed in Amsterdam during WW II..
Shahar is an unemployed filmmaker. His father, Sleiman, a strict 82 year old Yemenite, suggests that Shahar should make a film about the Jewish Brigade, in which he served during WW II. Shahar becomes enthusiastic when he realizes that his father may have left some "souvenirs", by having impregnated two Dutch women. He decides to make the film hoping to find his father’s lost off - spring and maybe lessen some of the burden of his father’s criticism. They set out together on the trail of the Jewish Brigade, beginning in Israel and continuing through Italy, Germany and ending in Holland with a surprising discovery. With humor and compassion the film exposes a complex father-son relationship and raises universal questions and thoughts about the tension between myths of bravery and reality and between memory and historical truth.